Woodturning is a wonderful pastime, one of life’s pleasures and not to be missed. 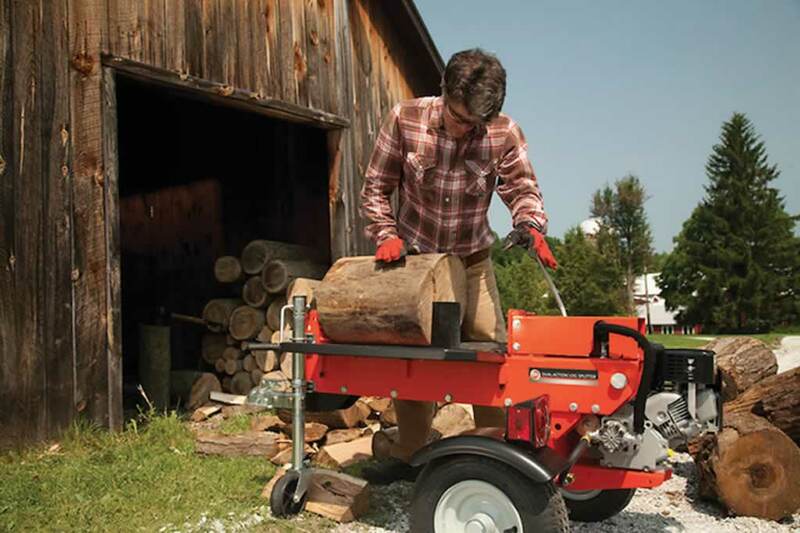 The turner magically and effortlessly shapes a rough piece of wood into a useful and attractive object in a matter of seconds. Woodturning is great fun and easier than it looks. It comes close to being the ideal hobby and if you want, it can lead to a money spinning sideline or full time career. Woodturning is one of the most interesting ways of forming natural wood and it is hobby of choice with increasing popularity. Numerous traditional examples of wood turning can be found in most homes and work places. These include, table lamps, table legs, and bowls. 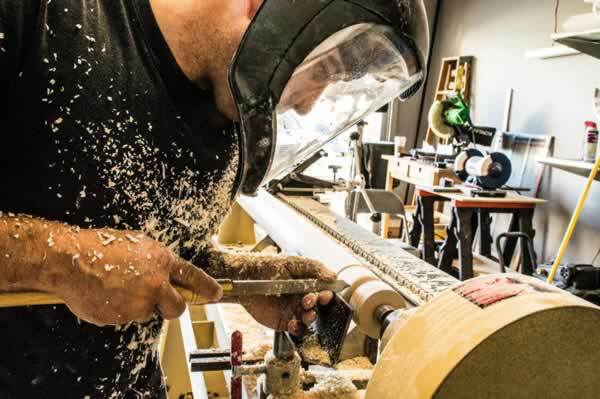 Woodturning differs from most other forms of woodworking because the wood is moving while a stationary tool is used to cut and shape it. Many intricate shapes and designs can be made by turning wood but enough with introduction and let’s start talking about the tools. The range of woodturning tools on the market is enormous. There are literally thousands of types and different variations and if you don’t know what to look for, you can easily spend a lot of money on tools which you don’t need and ending up without the tools you actually need. In this article we will try to explain basic woodturning tools and their uses and suggests what, by our opinion, every beginner in woodturning should have. 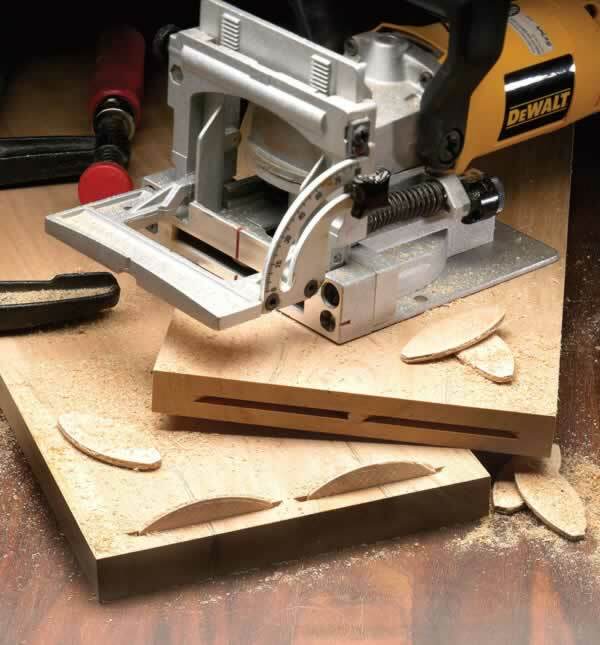 Scrapers are used for taking very fine cuts in the process of smoothing a surface or taking just a wisp of material away from a tenon or recess to achieve a fit with a matching part. Scrapers are available in many shapes and sizes to accommodate a variety of needs. Inside a bowl, a scraper can be used to finish the side-to-bottom transition area and making the final cuts on the bottom when the geometry is such that a gouge cannot be used. Five typical types of scrapers are square nose, left skew, right skew, round nose and half round, but the most common one is round nose scraper. Also, there are different types of scrapers depending on type of turning there are used for and the most common are 1/2 inch, 3/4 inch and 1 inch like in the set on the picture. Chisels usually have double bevels, and the bevel angles are smaller than those normally used on scrapers. Chisels are used for cutting and refining convex and parallel curves in spindle turning such as chair legs, table lamps, candlesticks, peppermills etc. They are great for cutting beads, vee cuts, cleaning up the end grain of say a tool handle, cutting chuck recesses and opening parcels. 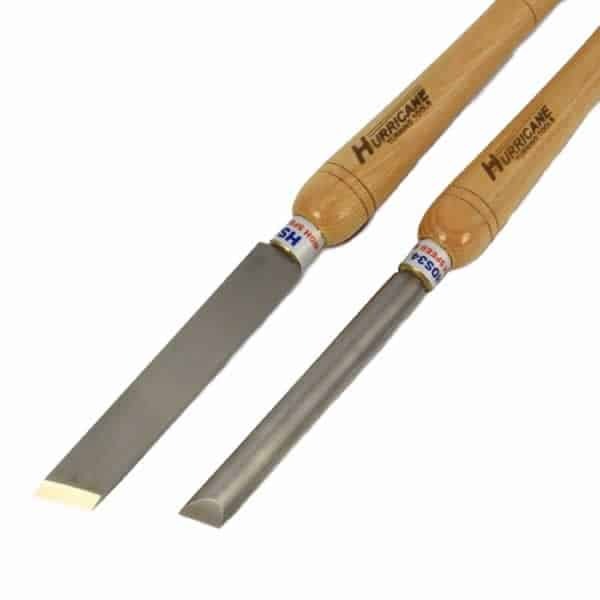 There are two main types of chisels, a square nose chisel and a skew chisel. 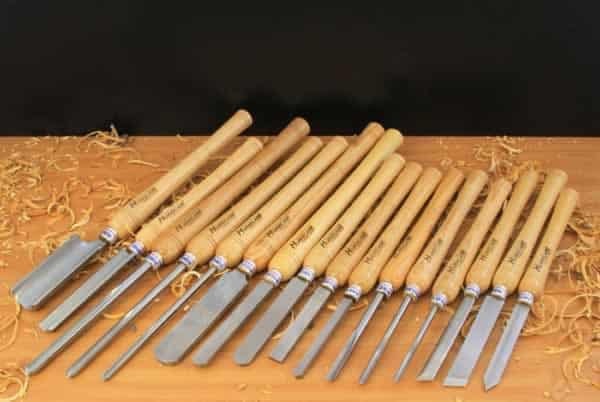 Also there are round (oval) skew chisels intended for use on spindlework, their round shape makes these tools highly maneuverable in creating beads, coves and other details. 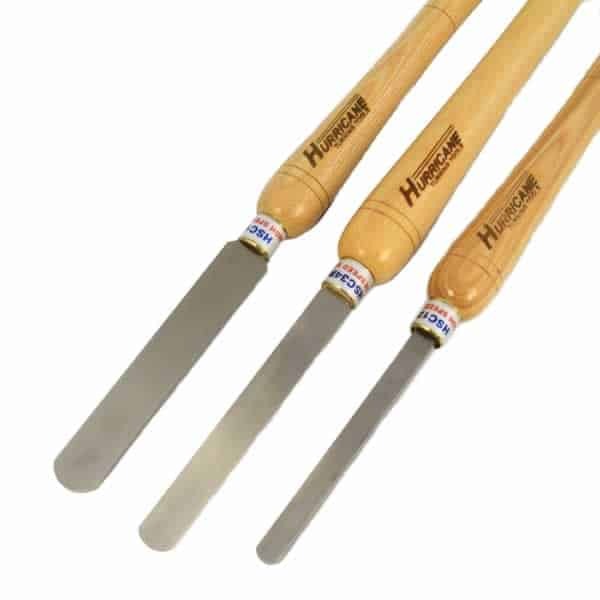 Chisels also come in many sizes from 1/2 inch to 1 1/4 inch thick. 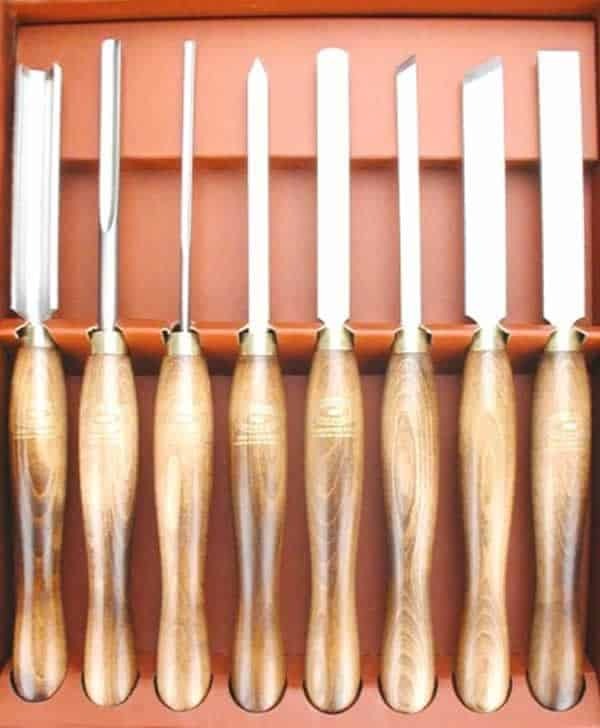 For a beginner we recommend standard square nose skew chisel and round skew chisel set like in the picture below. Parting tools are in fact narrow chisels. In principle, as their name suggests, they are used for separating the waste material from either end of the finished piece of work. In practice they have a number of other uses. They come in a variety of shapes and sizes like slim parting tools, standard parting tools, diamond section parting tools, fluted parting tools, beading&parting tools and bedan parting tools. Slim parting tool is handy and designed to give the cleanest and finest of cuts with the minimum of waste wood. 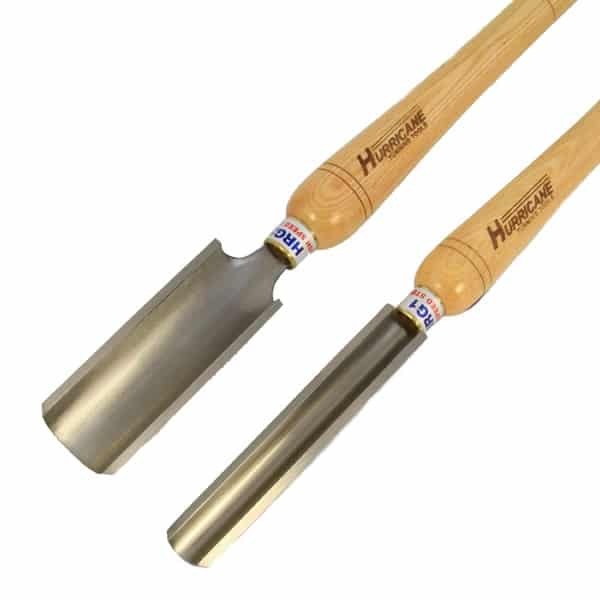 Standard parting tool is used to part the finished project off from the waste material, the parallel sides make for a rigid tool that handles well. 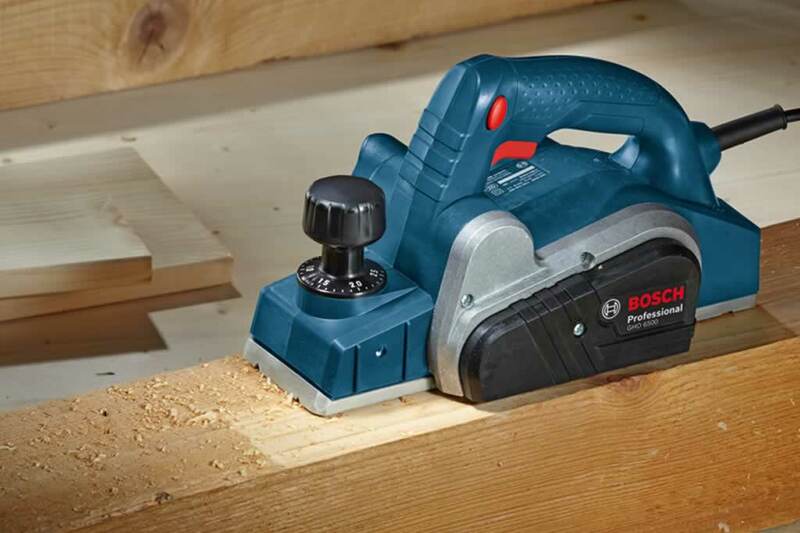 Diamond section parting tool reduces the risk of binding in the cut. It also reduces the amount of heat build up caused by friction, thereby lessening the chance of burning the bottom of the parted project. Fluted parting tool has a milled flute running along the bottom edge, creating two sharp spurs at the cutting face. These sever the fibres to produce a burnished finish. Beading&Parting is a versatile tool used for parting off as well as producing beads. Bedan parting tool is used in the same way as the beading and parting tool the relieved side bevel allows the tool to plunge cut in bowls and boxes with little risk of binding. Woodturning gauges come in variety of shapes and sizes depending the use intended for each type. There are three main types of gouges: bowl gouges, spindle gouges and roughing gouges. In every category there is a lot of gouges and we will explain the most common ones. 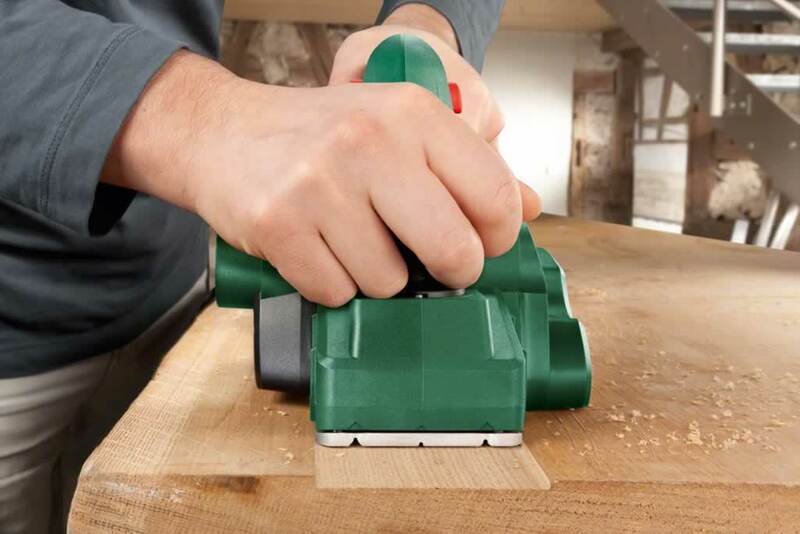 Standard bowl gouge is a must have in the tool kit of every bowl turner. This tool is ideal for making bowls. It can produce either massive profiling cuts or delicate as necessary. Fingernail bowl gouge is used for heavy profiling cuts and fine, delicate shearing cuts. Standard spindle gouge is a detailing tool used on between-centre work, where the grain is running parallel to the bed bars. It is used to create coves, beads and other profiles on goblets, vases and egg cups.Fingernail spindle gouge is ideal for detailing on spindle work. Having the wing tips ground back reduces the danger of them catching when working in confined areas. Continental style spindle gouges are originating from Europe. These tools have gained a reputation for their superb handling qualities on spindle work. Being a forged construction, they have an even wall thickness, thereby increasing the finesse without compromising the strength. Roughing gouges are recommended for the initial turning of uneven or square stock to round. The shape of the roughing-out gouge enables the tool to cut safely with the wings well back from the workpiece. The ring tool is designed specifically for end grain hollowing. The dual bevels allow for hollowing of internal curved surfaces and flat bottomed vessels. These tools produce an unrivalled surface finish on end grain and they are ideal for goblets and egg cups. Carbide woodturning tools have the same purpose like the regular gouges, scrapers and chisels, but the don’t have the standard blade. Carbide tools have changeable cutters on top which can be changed when they become dull. This removes the need for sharpening tools. Many woodturners say that the quality of them can’t compare with standard woodturning tools but we will not take sides in this debate. We think those tools are very precise for working on small pieces and with them there is definitely no sharpening anymore. There is no woodturning without a lathe. There are many kinds of lathes on the market and it is difficult to decide what lathe to buy. First of all, we advise you to think ahead, maybe you want to start with a simple drawer knob and you need a mini lathe for that, but what if you want to make a large bowl in a month or two? 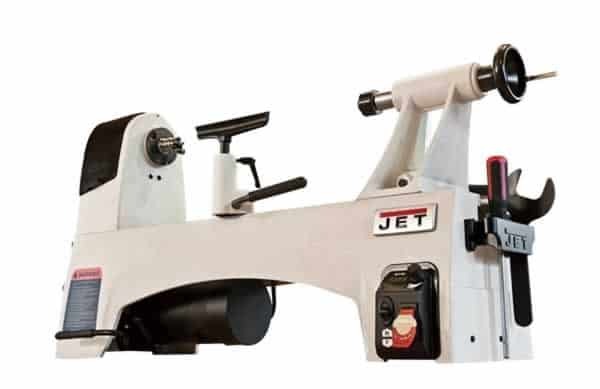 It is always better to buy a medium sized lathe like in the picture below which will be suitable for all your projects in the future. If you can’t afford a lathe then you can check out our article about DIY mini lathe. By our opinion there are some basic woodturning tools which every woodturner should have, except of a lathe. Those essential tools are 3/4″ roughing gouge, 3/8″ spindle gouge, 3/8″ beading tool, 1/8″ parting tool, 3/8″ bowl gouge, 1″ square end scraper and 1″ round end scraper. The opinions on what are basic tools vary but we think that those tools will be adequate for finishing every simple woodturning project. If you buy every piece individually you will most likely pay almost 50% more than when buying already complete kit. If you want a high quality set which will last for a long time then we recommend Hurricane set, PSI set, Savannah set, Crown set or Robert Sorby set. Once again we must emphasize that woodturning is a remarkable hobby and that you can make beautiful things from a piece of wood. 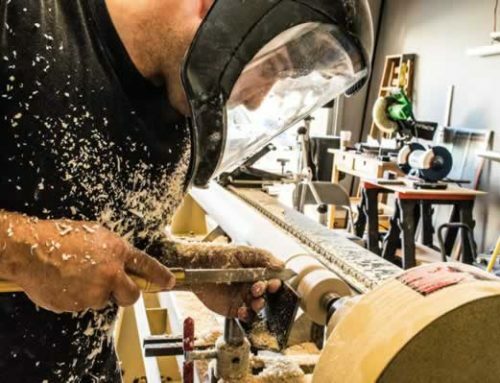 We hope that woodturning tools became more familiar to you after reading this article and we hope that you decided to give woodturning a chance. At the end we must advise you to always buy the best tools and equipment you can afford. Quality is better than quantity. Woodturning lathes and tools are easy to sell secondhand if you ever change your mind about woodturning, but you won’t! Hello I’m an artist from libya North Africa how i can get this sclupture tools thanks. Really informative and constructive advice. I started with a Record Coronet and 2 basic tools for a home project 6 months ago. I now have 15 tools and a top end Jet lathe arriving next week. Be warned, turning is expensive and highly addictive! Thanks for the primer. I think that it is worth mentioning that whereas some tools may be interchangeable depending on the task at hand, some are not. For example, making the mistake of using a spindle roughing gouge for bowl turning could result in serious injury! The distance is not the problem, they are shipped worldwide! I would love to have a set of these chisel shame it’s so far and how much is a set of 8? thank you for your comment but unfortunately we can’t get an accurate translation and therefore we can not answer to your question! We are sorry once again! Gostaria muito de ter um jogo destes formão pena que é tão longe e quanto custa o jogo de 8.